Homepage. 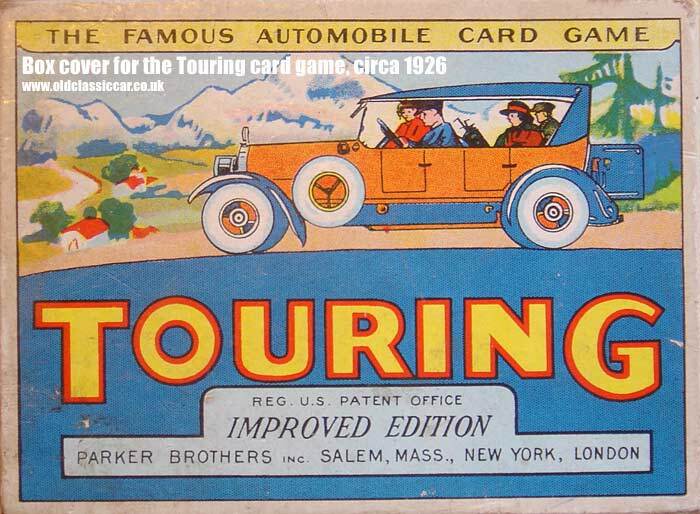 This page: 'Improved Edition' of the Parker Brothers' Touring game, introduced in the 1920s. 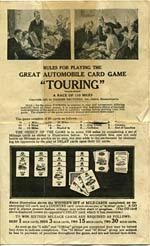 Touring - a motoring card game from the 1920s. This cracking motoring card game turned up a few years ago, complete in original box, with playing cards and instruction sheet still in place. The box, which measures approximately 5.5" x 4" features a fine, American-looking (LHD) touring car on the cover, with full complement of occupants on board, enjoying their automobile outing. Apparently this is the 'improved edition' of the game, produced by Parker Brothers (Salem, Mass., New York, London) towards the tail end of the twenties. Open up the box and a great collection of illustrated cards present themselves, a selection of which are shown below. 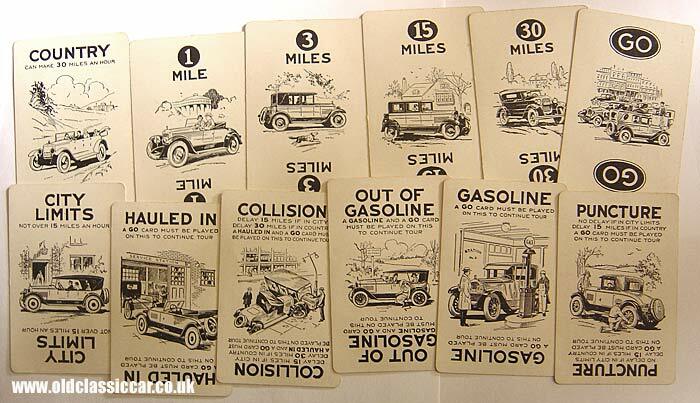 Various playing cards and motoring situations feature, including driving your motorcar at 15 mph within city limits, being hauled in to a service station, a collision with another car and a lamp post, running out of gas (which in dear old Blighty would of course be referred to as Motor Spirit! ), filling up with gasoline, and suffering the ignomy of a puncture while the good lady watches on. "NOTE: As the game TOURING is original in play and amusement, differing radically from all other games, it is suggested that beginners obtain a thorough understanding of the general rules by carefully reading before starting their first game. The pleasure of the game correctly played will reward them amply." The idea is to build up a 'hand' of 110 miles, made up of a set number of mileage cards. These cards are '1 mile', '3 miles', '15 miles' and '30 miles'. To win, you need to end up with 110 miles broken down as follows: 2 x 30 miles, 2 x 15 miles, 4 x 3 miles, and 8 x 1 miles, totalling the 110 ... "To accomplish this, one not only builds up Mileage as quickly as he may, but also adds to the excitement by obstructing his opponents by the play of DELAY cards upon their GO cards". The instructions then continue for a couple more pages, outlining how to start off the game, and progress through to someone winning the game. I've not played this game, so sometime I'll sit down and fully fathom out exactly how this all works. The instruction sheet, and the game as a whole, is obviously of American origin, the instructions being printed in the USA and enquiries about the rules of the game, welcomed simply by sending the player's query (with return postage stamp) to Parker Brothers. The game, in 1926, cost just 75 cents. After reading around a little, I've discovered that the game was revised a number of time in future years, with revised versions being introduced possibly in 1937, 1947 and 1958, with even later incarnations coming along in more recent years. The very first version of this game was brought out by the Wallie Dorr Company of New York, in 1906.